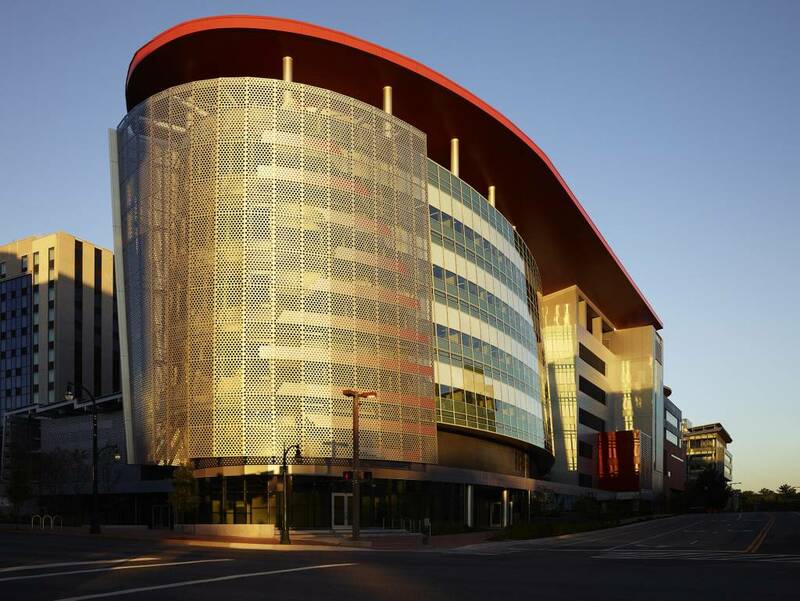 A biotechnology company has added a six-story net-zero building to its downtown campus in Silver Spring, Maryland. Designed by EwingCole, the 19,510-m² (210,000-sf), elliptical shaped Unisphere is one of the largest net-zero buildings in the country. It houses clinical operations for pulmonary disease, heart failure, and organ transplantation as well as a virtual drug development lab. 3000 solar or photovoltaic (pv) panels on the building generating 1175 mWh of energy each year, enough to power 100 homes. A quarter-mile-long concrete maze is located 4 m (12 ft) below the Unisphere. This natural ventilation system, moderates temperatures within the atrium as compared to the exterior climate. Beneath the Unisphere, 52 closed-loop, dual-circuited geo-exchange wells are drilled 152 m (500 ft) into the earth to provide energy storage. Operable windows and panels allow the building to naturally ventilate, thereby providing a completely passive ventilation mode between certain temperatures.